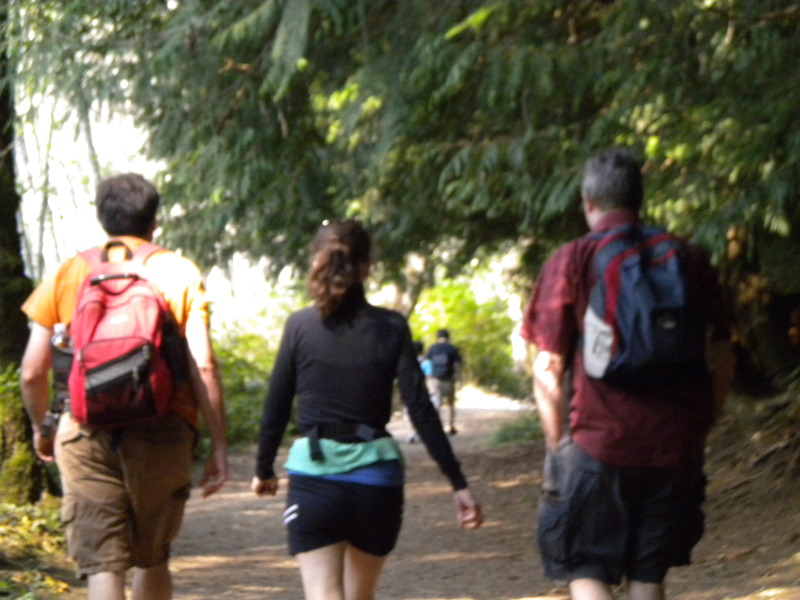 My friends walking ahead of me on a gentle hike on Bowen Island B.C. The haunting cry of a seagull mingles with soft music playing in the background. I inhale, reaching my arms skywards, my face turned towards the sun long enough to feel it’s welcoming kiss; I swoop forward, bending towards the cool earth, my hands dangling above whitewashed daisies rising up from the lush ground, lingering just a moment longer to enjoy the intoxicating scent of sweet grass and lavender. For twenty, maybe thirty minutes of my yoga routine, I bask in the smooth suppleness my body has granted me this warm spring morning. The temperamental weather of a west coast spring has laboriously transformed the dark chilly mornings of winter into the radiant days of a new season. The cherry blossoms exploded early, bursting into pink blushing parasols suspended over the avenues and lanes between houses. Feathery pollen drifted in the air like frayed cotton balls, waking up allergies in every person I know – but for all that, I celebrate this magnificent transition, because I know that along with new life arriving on earth, my joints will undergo their own rejuvenation. RA has changed the way I move – my desire to exercise has declined in the onset of morning stiffness and sore joints. As a former dancer I am used to working through pain, but with the inflammation of RA comes fatigue, and that is an entirely different beast – it rolls in like the murky seawater brume that consumes the shorelines on chilly mornings, sucking me down into its colorless world. The winter months don’t inspire me to remain active, and although I make every effort, it can sometimes be a struggle to get moving. More often than not I find myself curled up in fleecy blankets hoping to steep my joints in warmth, watching the anaemic sun sink below the horizon through hazy windows trickling with condensation. In recent weeks I have eagerly followed the progression of rising temperatures, counting the days until I could return to the gentle water of the pool and rediscover the great outdoors. I am fortunate to live in a place that supports a variety of outdoor activities – biking, hiking, running, tennis, walking, and swimming go on all year, but especially when the days are bright. These temperate days wake me from my lethargic hibernation, stimulating me to move once again. Longer days offer more opportunity for evening walks; mild mornings lend themselves to extra sessions of yoga and swimming. I haven’t been on a bike in many years, but this year there has been talk about wiping the cobwebs off our steel frames, oiling up the chains, pumping up the tires and cycling the sea wall or rolling along paths beside the river. I look forward to the first gentle hike in the rustic mountain trails, a refreshing escape from the relentless buzz of city life. As the weather warms, I bloom back into activity. Spring and summer are the seasons that motivate me physically. I always appreciate the splendour of crimson and auburn leaves in the fall, and the first snowfall on a winter night, and even in those cold dark months I seek out ways to keep moving – a walk, yoga, or a weekly ballroom dance class. I have no excuses – whether it’s summer, fall, winter or spring, it’s essential for me to keep moving. Exercise keeps my body fit and my mind sharp. I don’t scold myself on days of inactivity – nothing is gained by slamming my choices – I accept it as a time to recharge and have faith that the next day I will find a way to move. Movement is the fertilizer that warms my body and nourishes my joints, giving them the opportunity to bloom again and again. Amen. I can so relate to this. Except for the yoga but this is 2 items I’ve read in 2 days that are encouraging me to try yoga again. Yoga is not for everyone. I loved it for keeping my flexibility up when I was dancing, but now I have to use alternate positions for some moves to keep pressure off my joints. I still enjoy the stretches I get out of it. I think if you don’t get right into the full swing of yoga, there might be some positions you can use as warm ups for your other activities. Hoping all is well with you. X. So much visual feeling. It’s like I’m in your shoes when I read your stories. The joy, pain and the determination. Thank you. I hope you are never in my shoes longer than it takes to read the story. Wishing you wellness and continuing happiness. X. This is a prime example of why I love your posts. You take a moment, make it special, and include all of us. Happy summer. Thank you. 🙂 Sending a hug your way X.